This fully furnished, 60Sqm condominium is located at Tranquillity Bay Residence. 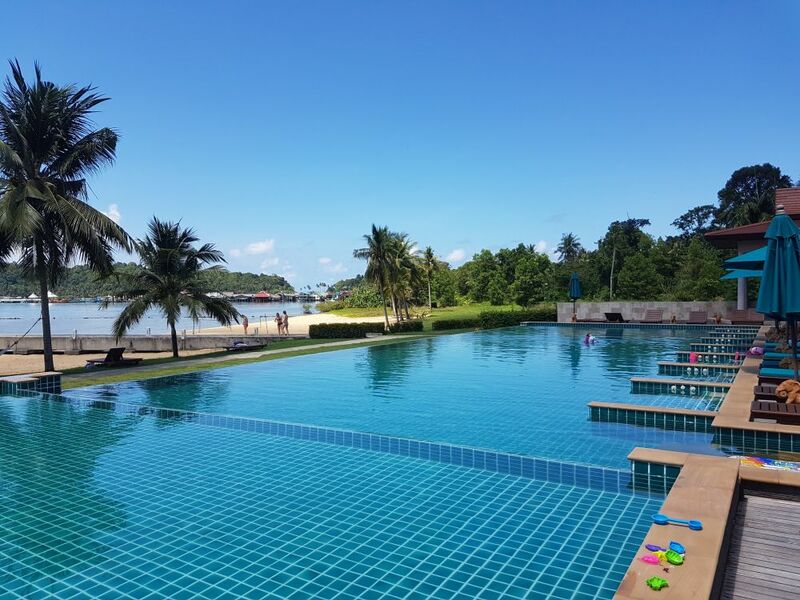 It is a bright and airy corner unit situated on the upper floor with amazing, unobstructed views towards the islands south of Koh Chang and across to Bangbao fishing village. Facilities include a beachfront pool and 230 metre long private beach. Another two beaches are under 10 minutes walk away to the east and Bangbao fishing village is 10 minutes walk to the west. Living area: Step out of the kitchenette and you’re in the living area. There’s a comfortable sofa, armchair plus writing desk and chair, for anyone needing to spend time working whilst on vacation. A second 32″ TV provides over 50 international and local channels. The room is air-conditioned. However, the patio doors and windows have retractable insect nets fitted which allow the cool night air and sea breeze in but prevent any bugs from getting inside. Balcony: The floor to ceiling patio doors open out from the living room onto the balcony from where you get great views across the bay. There’s plenty of space to sit outside and this shady terrace makes for a great spot for morning coffee or a glass of wine as the sun goes down. Tour and Excursion Counter where guests can also arrange motorbike rental & car hire, book minibus tickets. Free parking for scooters and cars is available onsite. The apartment is in Tranquility Bay Residence on the south coast of Koh Chang. This is a quiet location, away from the busier beaches on the west coast. However, everything you need is within walking distance. The development comprises a total of 65 condominium units, which have already been constructed and a maximum of 6 beach villas. It is built on 17 Rai of land which slopes down from the hillside to the beach. 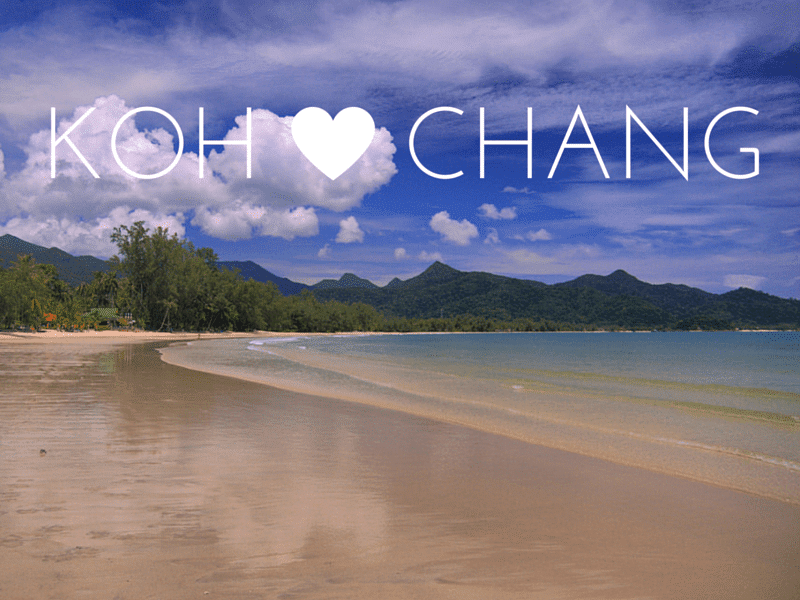 The beautiful Klong Kloi beach is under 10 minutes walk away. Here you will find lively beach restaurants and can also rent a kayak or Stand Up paddleboard. Nearby the smaller, Hat Sai Noi, is a little hideaway, with a handful of small beach restaurants which are open from early morning until late evening. Bangbao village, also 10 minutes walk, is the departure point for snorkelling and dive trips to the nearby islands. It’s also home to several good seafood restaurants plus numerous shops. 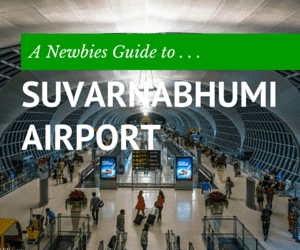 You’ll also find facilities such as currency exchange and ATMs and a 7-eleven mini-mart here. Whilst there are longer and busier beaches on the west coast of the island. The views, to the south of Koh Chang towards the outlying islands, are infinitely better. Years ago we also bought a dilapidated fisherman’s house adjacent to our guesthouse in Klong Prao, with a view to rebuild it. However as time went by, it was clear that the government wasn’t going to make it easy for people to do this and around 3 years ago, it became impossible to get any permission to rebuild this type of house. As they are in a legal grey area – being built on river or sea beds, not on dry land. So that plan was shelved. But in late 2017 the government and Navy officials surveyed all the fisherman’s houses, not just on Koh Chang but across Thailand. And in mid 2018 the first people in Trat got their ownership papers which made their properties legal and made it possible to get permission to rebuild legally. So, next year, once we get the papers, we’d like to rebuild the fisherman’s house, but this requires the cash that was spent to buy the condo. Which is the reason it is now for sale. It is Leasehold. Which means that a foreigner can own it in their own name. No need to set up a Thai company or put it in the name of a Thai spouse or partner. The original owner, a Norwegian, signed a 30 year lease in 2011, which was legally registered at the government Land Office on the mainland. There are around 23 years left on this lease term. The terms of the sales contract for the apartment states that the developer agrees that the lease can be renewed for two additional 30 year periods. This sales contract was drawn up by Johnson, Stokes & Masters, one of the top law firms in South East Asia. When I bought the condo, an agreement to buy was signed ; a deposit was paid; paperwork assembled and a date set to complete the sale at the Land Office. At the Land Office, the old lease was cancelled and a new lease, for the remainder of the original term was signed. It’s a relatively simple process. Ideally the buyer and seller will go to the Land Office in person, but a lawyer can act on your behalf. The same process will apply to the new owner. It is possible to rent the apartment out to visitors through Airbnb when you aren’t using it. If you prefer someone to handle the rentals for you, one of the fellow owners runs a property management company handling this for owners. 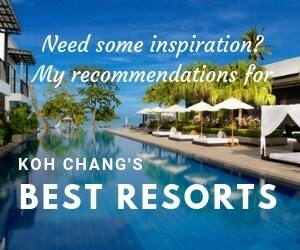 They manage several properties on Koh Chang and get excellent reviews. Interested? Contact me . . .
‘Cirz’ Koh Chang Beach Condos. From THB 3.99 Million.